​When World War I began in the summer of 1914, many of the young soldiers heading off to the battlefields of Europe believed that the war would be over rather quickly. In fact, the phrase “Home by Christmas!” became popular at the time and reflected the view that the war would be a quick adventure that many of the soldiers did not want to miss. Soon after the war began, the German plan of attack (Schlieffen Plan) failed to knock France out of the war and the war became bogged down in the stalemate of trench warfare. Soldiers were soon faced with the reality that the war would not be over by Christmas and that they would be celebrating the holiday from their trenches. The “Christmas Truce” is the name for a series of unofficial ceasefires that took place along the Western Front around Christmas 1914, during World War I. 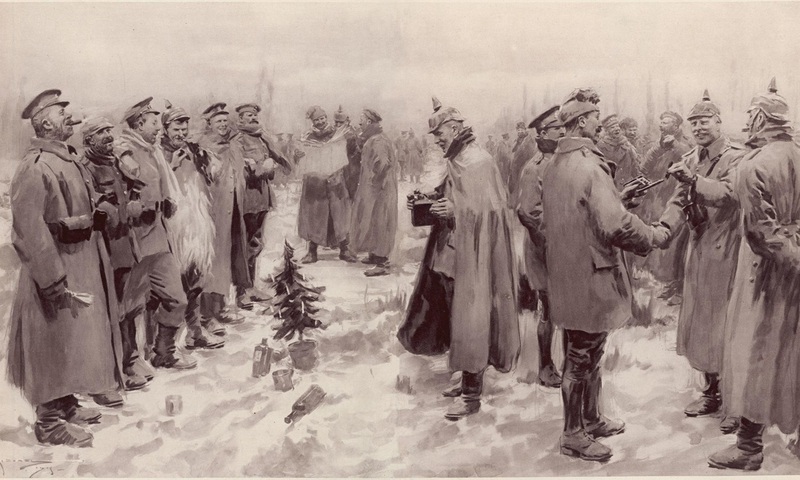 In the day before Christmas, there were reports of both sides (Allied and the Germans) exchanging greetings and singing Christmas carols between the front line trenches. In a few instances, the tensions between the front line trenches lessened to such a point that soldiers from both sides came out to “No Man’s Land” on Christmas Eve and Christmas Day and met each other. They used the chance to meet, shake hands, exchange small gifts and sing carols. Also, they used the peace to retrieve and bury soldiers who had previously died in the battlefield. As well, it was reported that in a few places, soldiers from both sides played football (soccer) with each other. While, World War I is remembered as a time of incredible human suffering and death, the Christmas Truce of 1914 is often seen as a symbolic moment of humanity. Military commanders on all sides hated the truce believing it softened their soldiers. They feared that the incident would cause soldiers to identify with their enemy and find it difficult to attack and kill the other side in the days and weeks that followed. Therefore, similar truce’s were banned in all future Christmas’ on the front lines and the event never occurred again. © COPYRIGHT HISTORY CRUNCH 2015-2019.